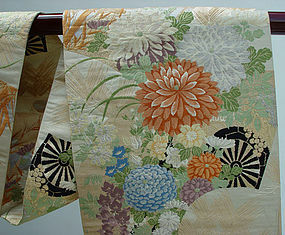 This is a beautiful Japanese obi. The style of obi is maru obi which is the most formal obi in recent years. It is made out of one long fabric that is folded in half. The dimensions of the obi are 12 3/4" wide and 13'3" (159") long. It is a large obi but very soft and light for its size – it weighs 3.5 pounds. The colors are all gentle including the gold threads. The design includes flowers (chrysanthemums and others), bamboo and a palace wagon over the multi layers of fans. This is a Nishijin obi from Kyoto. There was tremendous workmanship involved when this obi was made; different colors of threads and weave patterns were used to give detail in the flowers and plants. Japanese Obi, Ox Cart, Music Instruments, Fans Summer Silk Obi, Flowers Fans in vivid colors Japanese Silk Obi, Shell matching Box, Fans, phoenix ..